As my wife said to me, she gets to relax on the beach, and I get my Disney fix. Just to let you know, despite some of the criticism I’ll share, this is our favorite Disney resort – and its not even attached to a theme park. Aulani provides comfort, beauty, relaxation, fun, and a variety of options to last you at least all week long. The staff gives guests that Disney touch which sets a Disney resort apart from all the rest. And now that they have Ulu Cafe (I’ll review that separately as I will all the different Disney restaurants), food options are even better than when we came here six years ago. Overall Room Impression: Since we’ve come to Aulani using our Disney Vacation Club points both times, it’s hard to assess what a “regular” room is like, but we LOVE the view! We’ve asked for ocean view both times and it is WORTH it. Waking up to a beautiful sunrise every morning, seeing a gorgeous sunset every night, getting to look over the entire resort every day is just awe-inspiring. Every room has a balcony with chairs and tables so you can come out and just take it all in. The room itself is exactly what you’d expect from a high-end resort in Hawaii. They have thought of your needs and sought to accommodate them. There is an in-room DVD player so you can bring movies for the kids to watch and you can rent them from the Pau Hana room (which is basically the community room). The TV is a great size. There are enough plug outlets for the needs of most families. And the lighting is good. Also, the blackout curtains actually work! And the glass door leading to the patio really suppresses outside noise so kids making a splash outside doesn’t affect the quiet time you want inside. Beds: Probably the most disappointing part of our visit. The beds were hard as a rock! I don’t know if it was just our room since the last time we were here, this didn’t seem to be an issue, but it was back-breakingly tough to sleep on. The sheets and pillows are super nice and the pillows in particular are really luxurious, but WOW that mattress is a layer of stone. The nice thing about the beds is that instead of a box spring (which might have made it softer) the mattress is set on a hard frame that allows space underneath for even the biggest of luggage (okay not a steamer trunk). Unless you get a two-bedroom suite, the extra bed is often a sofa bed so my daughter slept on that all week long. While comfortable, it isn’t a replacement for a real bed. Bathroom: Hard to find anything to complain about here. The toilet area has a separate door so family can shower and use the sink while someone else is “using the facilities.” The combination shower and tub (in the 1 and 2 bedroom villas, there is a separate shower room!) is great. The shower can be either a rain shower or a regular shower and tub is spacious enough to be comfortable in. There is ample room around the sink for toiletries without feeling too crowded. And the quality of the shampoo, conditioner, and soap is high class. WiFi: Sadly, I can’t recommend the resort WiFi. It is slow and spotty. If you like playing games IRL on your phone or iPad, you’ll need to connect some other way or risk a spotty connection. It’s good for basics like email without pics, but I’m surprised that a resort of this high caliber hasn’t boosted their WiFi capabilities. In-Room Amenities: Now, there isn’t as many “freebies” as you get at any of the Asian Disney locations (they love their freebies), but besides the upscale toiletries there are a lot of nice features like robes to use in the restroom (not free), a good in-room safe, a nice sized refrigerator (which we definitely used), a good microwave oven, plenty of tea and coffee, extra sets of disposable utensils as well as plates and bowls, and a decent amount of trash cans. If you get the bigger rooms like the 1 and 2 bedroom villas, they have full refrigerators, a stove, and an actual dining area. Activities: This is really where Aulani excels. There are great things to do every day! And none of them are intrusive. 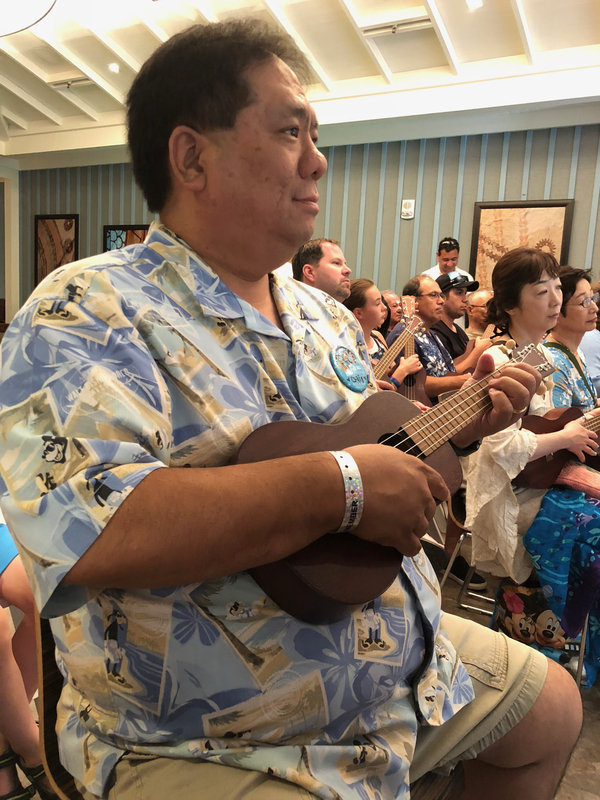 You don’t need to reserve the entire day just to make it to a ukulele class. Which they offer for free. Ukulele included. Many of the activities are only on certain days but are offered at least three times a week so no matter when you come you should have the chance of taking part in whatever you want to do. Some do come at a premium and some are included. Ukulele is free but the star gazing class does have a premium. T-shirt stamping is very reasonably priced. You’re basically paying for the shirt and materials to do the craft and you get a take-home souvenir. 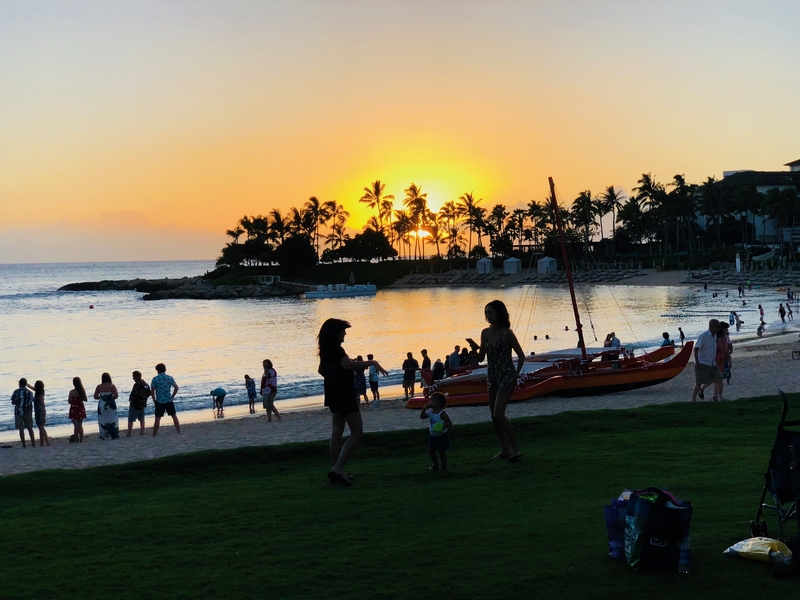 There are free tours of the property which is rich in cultural history, free storytelling by the fire, free hula classes, and of course pictures with many of your favorite Disney characters. They even have great options for kids and teens (but not as many for teens any more). Aunty’s Beach House is an amazing place for your young ones with supervised care and great security. And they will have a blast! Oh, if you like working out, they have a multitude of classes every day. Get your fitness fix in the most beautiful place you could imagine. Food Options: Surprised that a resort of this quality only has one table service restaurant and it is only okay. AMA’AMA is not what we hoped for. It has a great view, but very overpriced for the quality of food and the preponderance of children does not make it a romantic dinner out. There are no other table service options for a nice meal out. Makahiki, while having great food and a wonderful character dining experience, wasn’t very allergy friendly, but otherwise a wonderful place to eat – especially for families with kids with the added bonus of having characters come right to your table for pictures. Ulu Cafe doesn’t have much seating but it’s meant to be a “grab and go” option which it is. And they have great tasting food. 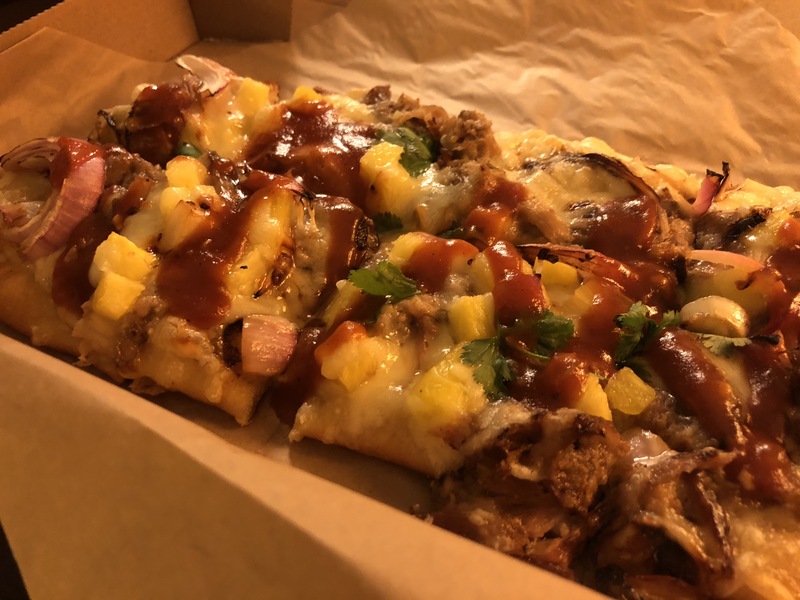 Try the kalua pork flatbread! Mama’s Snack Stop has some quick fast food selections and Little ‘Opihi’s has sandwiches on the beach but you can go somewhere else for those things at a much cheaper price – like right across the street. And Papalua Shave Ice just isn’t anywhere near the quality of a place like Matsumoto’s on the North Shore or some of the other shave ice places you can find. We even have a place in Fresno that’s better. Yes, Fresno. Pools: If you rated resorts based on their pools, Aulani would get a five-star rating hands down. They have a NUMBER of pools, decent number of deck chairs, a Rainbow Reef for literally swimming with the fish, TWO awesome water slides (one a tube slide and the other a body slide), an infinity pool, an adults only pool, a couple of hot tubs, a lazy river that is one of the best we’ve ever experienced, and if that’s not enough, a private beach! Wow. And it’s all beautiful and beautifully maintained, too. Overall, Aulani is a resort that is excellent! A staff that cares, a place that’s beautiful, and comfort in the midst of an oasis! A wonderful place for the whole family. Thanks! And yes, Ama’ama was good but not great value for the money.